One the file is downloaded, create a ‘PHP’ directory on your hard drive (i.e., C:\PHP) and extract the contents of the zip file to that directory. Add the directory to the PATH environment variable. Rename the ‘php.ini-recommended’ file to ‘php.ini’. Set open_basedir to point to a folder or network path where the content of the web site(s) is located. If all is well, the console will scroll full of text that shows the current PHP configuration. Now that the PHP core is installed and working correctly, it is time to move on and configure IIS to correctly handle PHP file mappings and to help it understand how it is to render PHP script code. Normally under Windows 2008 and IIS 7, FastCGI would be used to assist in rendering the PHP code, but such doesn’t exist with the older version of IIS (5.1) that runs on Windows XP. We’ll have to rely upon an ISAPI extension instead. That’s why we grabbed 5.2.10 as it has the pre-compiled ‘php5isapi.dll’ file that we’ll need in the following steps. The later (5.3 at this writing) distributions of PHP don’t include this file, but it is possible to compile it yourself if you want to do so. Open the properties of the default website and go to the Home Directory tab. 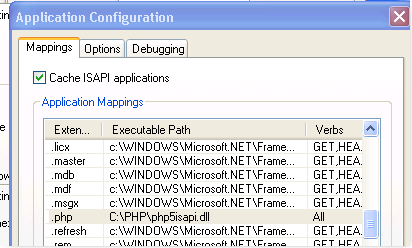 Ensure the execute permissions are set to Scripts Only and then click the Application Configuration button. Save the configuration and then open a command prompt and run iisreset. Note that if this is an upgrade/reinstallation of the PHP version (or downgrading) make sure to replace the ‘lib*.dll’ files in the \windows\system32 directory with the files that come from the php version being installed… Failure to do this will prevent some of the extensions (namely mySQL) from loading.I had to learn this the hard way and it caused me to pound some sand for a bit until I figured out what had happened. Look through the output of step 6, above, and verify that the ‘mysql’ extension loaded. If it isn’t listed in the webpage, then something is awry and needs to be corrected before phpMyAdmin can be installed. Congratulations! 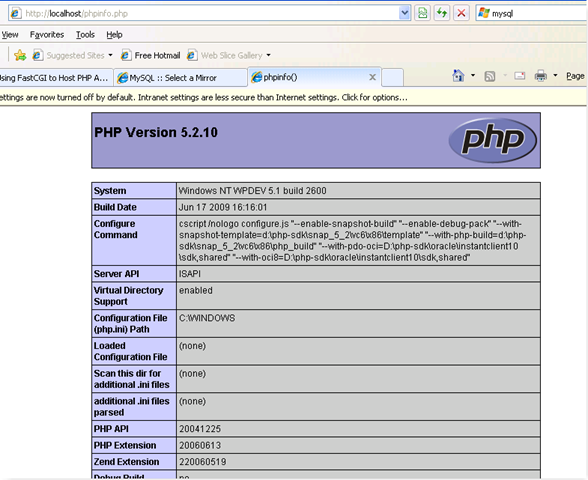 PHP is now installed and functioning correctly on IIS 5.1. Now we’ll move on to the MYSQL installation and configuration. I chose the .msi installer for ease of installation and uninstall/reinstallation if it became necessary at a later point in time. I performed a detailed configuration setup and chose all defaults and let the installer do its job. Once finished, I ran the instance configuration and chose a ‘developer’ workstation configuration and secured the install and finished up. Now that mySQL is installed, it’s time to install phpMyAdmin so that we can have a good GUI-based admin client for mySQL. Although this isn’t expressly necessary for a development environment, I run it on my production server and feel that I need to mirror things as much as possible. Once finished with the installation/configuration, be sure to create a wordpress database and user account. Also grant all access permissions to this user account on the wordpress database. Well, there’s not much to say about this that hasn’t already been said…:D It’s really nothing more than downloading the bits from www.wordpress.org and following the “5-minute install” walkthrough. So after all of this is finished up, you should have a nice, smooth (and local) installation of WordPress up and running. I love the VM aspect of it as it makes it portable and easily duplicated if needed, and makes it very nice to easily test things against – especially if you are offline. This entry was posted by Whitney Roberts on August 3, 2009 at 9:19 pm, and is filed under Wordpress. Follow any responses to this post through RSS 2.0.You can leave a response or trackback from your own site.